In the summer of 1981, Pete Shelley’s new solo sound hit like a ton of bricks. Martin Rushent had invested in a lot of soon-to-be-legendary tech gear after hanging out with the primordial Visage lineup as he gave them a leg up to get their first recordings done in ’79. He sensed which way the wind was blowing. 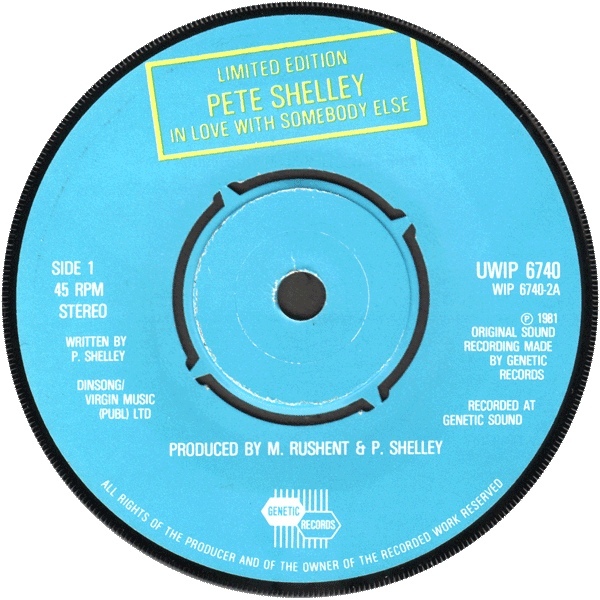 As 1981 got underway, he hooked up with The Human League and set about to recording demos with his old pal from The Buzzcocks, Pete Shelley. The Buzzcocks were in a bad place, financially and Shelley saw disbanding the group as the thing to do. Meanwhile, the demos he was recording with Rushent’s Linn Drum and Roland Microcomposer [an early workstation, more than a synth; designed as a compositional tool ] sounded fine without fleshing them out with full instrumentation. Island Records agreed, and gave Shelley a solo contract. I heard this single heavily on WPRK-FM in the Summer of 1981. The A-side was a burning, relentless tech-glam stomper in the same vein as his first solo single “Homosapien.” Only on this one the 12-string acoustics were replaced with dive-bombing electric guitars to play second fiddle to the up front synths. It’s cut from similar cloth to “Homosapien” but it lacked in freshness what it gained in intensity. WPRK-FM also gave just as much airplay, if not moreso, to the song’s B-side, the incomparable “Witness The Change.” Built on a snappy electro-latin rhythmic foundation, with more guitar crunch chords for emphasis, the number to this day remains my favorite Pete Shelley song, and a big part of the reason why I continued to pay attention to Shelley’s solo career. 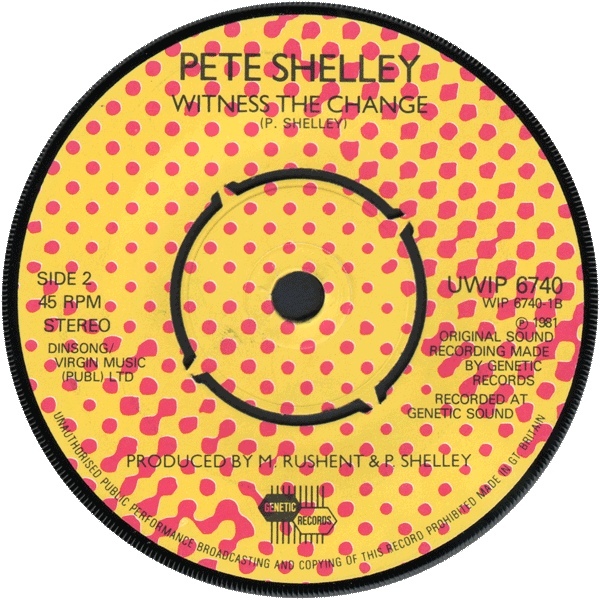 “Witness The Change” sounded for all the world like some incredibly funky Stevie Wonder track from the mid-70s given a high-tech New Wave coat of paint in the most delightful way. Sure, Wonder also dealt in synths, and before Shelley was a blip on anyone’s radar, at that, but I’ve never heard a Stevie Wonder cut this perfect for my ears. Also impressive was “In Love With Somebody Else,” that also got pegged for the US edition of the album. That was a good call from Arista. It’s a much better track that sounds like the sort of tune written for the abandoned fourth Buzzcocks album infinitely moreso than the dire “Pusherman.” The final track on the bonus disc here, really did sound like a demo instead of finished tracks like “Witness The Change.” “Maxine” was a simple drum machine, bass and acoustic guitar love song; pretty happy and guile-free from the pen of the usually more introspective Shelley. Need I mention that buying this single was a real value for money, even as an expensive import single. That meant that I paid $3 for this but with three strong songs on it [“Maxine” was slight perhaps owing to its lack of finish] including my favorite Peter Shelley song to this day, it was a fantastic ROI, by my reckoning. I later bought the US “Homosapien ” album, but held onto this due to the exclusivity of “Maxine.” Even though all of these tracks are on the “Homosapien” CD I have from 1994 [which got the track indices way screwed up, though it plays fine in a linear fashion] I must retain ownership of this fine record due to it being my single favorite Pete Shelley artifact. There’s something just deluxe about 2×7″ UK singles, and this one hits home with me for having such fine bonus material. 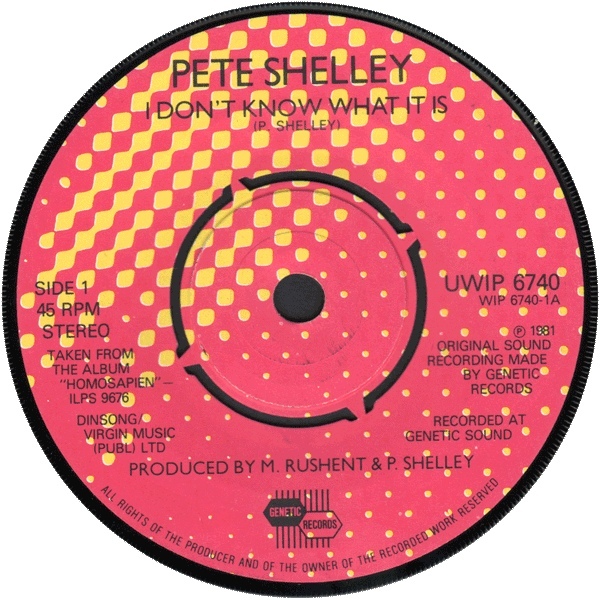 This entry was posted in Record Review and tagged 1981, 2x7", import, Martin Rushent, Pete Shelley, solo work. Bookmark the permalink. 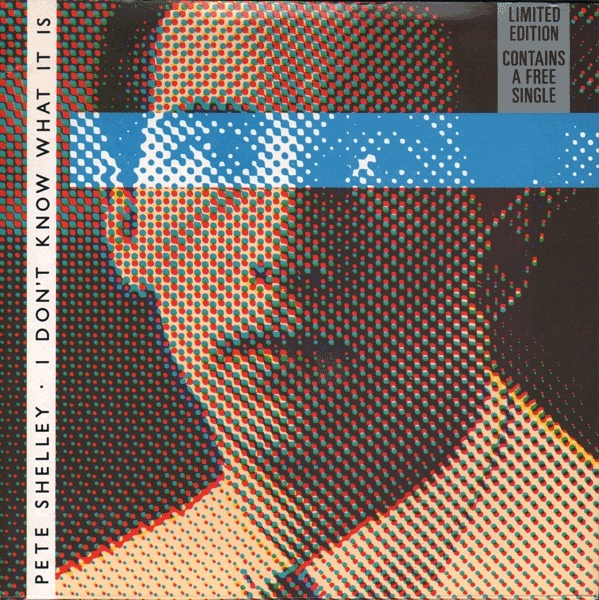 Pete Shelley and a synthesizer…a match made in heaven really. Who better than a DIY punk rocker to try his hand at DIY electronic rock. What Shelley and Rushent achieved on the first album was pretty darn brilliant. Echorich – I often think “XL1” achieved greatness, if “Telephone Operator” and “Many A Time” were the sole criteria. In some ways, I think it’s more consistent than “Homosapien.” Shame about album three. Well, that we’ll lay at Stephen Hague’s feet, eh? I agree with XL1. It continued, and tightened up ‘electro-Shelley’ (hats off to Taffy for that one!) and may have been a bit more accessible. As for Heaven And The Sea, yup that’s all the influence of Stephen Hague, in my mind. That third album veers on the pop goth in places. NOT Shelley territory. Echorich – “On Your Own” was a strong single. The rest of the album? Vapor. Can’t think of another cut. Oh yeah, Pete Shelley. Love this single, and honestly play both Homosapien and XL1 all the time. I recall feeling bummed about the demise of the Buzzcocks, but if they had to die so electro-Shelley could exist it was gonna be OK! Can’t believe they haven’t been reissued on CD in decades…as you pointed out, the track divisions and times get seriously wonky on the Homosapien disc. Wish I’d seen Shelley live at this point, but I had to wait till Heaven and the Sea came out to finally see him perform solo stuff. Added bonus – warm-up band was Figures on a Beach! Taffy – I remember people getting worked up in a lather because Shelley was touring solo for XL1 at nearby Hot-lanta back in 1983 at some time. People asked me if I were going, but I didn’t play that game yet. It wouldn’t be until 1985 until I sat in a car for 10 hours to see a gig. But once that line was crossed… different ballgame. Heck, we’d go to ATL just for kicks. Even if there were no gig a Saturday night in Hell [Masquerade] was usually fun.